I’ve never used a Dunhill fragrance until now, and I must admit that it is not a brand I’ve ever come across before. My first impression of Dunhill Desire Blue was that the bottle is awesome – it resembles a hip-flask and even has a cap that lifts up and flips backwards until you close it again. When I sprayed it for the first time I did not really like it. I thought it was a bit too strong for me. However, after a while (once it dried on my skin) it started to smell nice and I began to like it. It lasted for most of the day so I only had to spray it once in the morning. If it is within my budget I would buy it in the future. It is a good fragrance but I would not pay large amounts of money for it. The overall design is really cool and I think it’s perfect for my age group , 20+. Now I just have to test it around the ladies to see if I get any compliments! I recently received a bottle of Dunhill Desire Blue to review. Over the years, I have tried many aftershaves / EDTs, but few have impressed me as much as DDB. My first impressions on using for the first time was a wonderful sweet, fresh fragrance which immediately heightens the scenes and gives a sense of well-being. This fresh bouquet is very shortly replaced by a strong masculine woody fragrance which lingers throughout the day but is never overpowering. I continue to receive compliments about my fragrance which very rarely occurs with other brands. DDB is without doubt my fragrance of choice. I recently got a bottle of Desire Blue by Dunhill, and having never used a Dunhill fragrance before I was quite keen to try this one out. 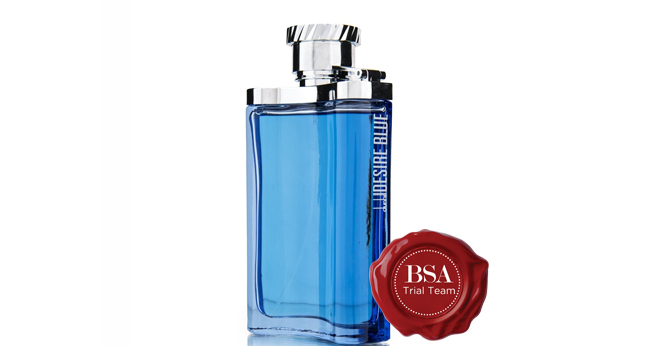 I liked the blue colour of the packaging and the fragrance bottle. It gave the bottle and fragrance a clean feel. Plus the bottle comes in the shape of a hip flask which is cool and easy to hold. After I sprayed the fragrance, first thing that come to me was summer, it made me feel like I should be hitting the beach. The citrusy, aquatic, almost fruity smell was quite refreshing and this is definitely a fragrance I will be wearing more often, especially come summer time with the sun shinning bright. The only gripe I really had with the fragrance was that the scent never seemed to stay on too long, so come lunch-time I felt that it was no longer there. Otherwise a great refreshing smell that just begs for summer to come a little early.